Sometimes we need to build a smaller circuit for our projects, but unfortunately, we can't use a breadboard or perforated copper board. I'm trying to use this in python... and I am a bit confused. So far I have just been using the FSYS Linux I2C Commands (i2cdetect,i2cget,i2cset) based on the i2c registers of the PCA9685. For example its address is 0x40 and the four byte registers for led0 are 0x06 for ON_L, 0x07 for ON_H, 0x08 for OFF_L, and 0x09 for OFF_H. I see that ON is the value from 0 to 4095 corresponding to when in the period the pulse starts, and OFF is the value from 0 to 4095 of the period when the pulse ends. I also see that this is a hex value, not a dec value, and that ON_L is the last two digits of the ON value in hex while ON_H is the first two digits of the ON hex value. Turn on the pulse at 10% of the period and turn it off at 30% of the period so the signal is on a total of 20% of the period. Yet this isn't working, though to my best knowledge this should work. I set the registers and that works. 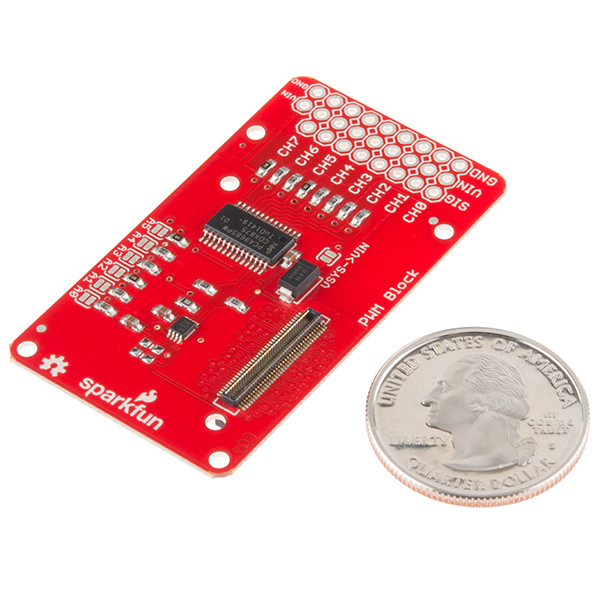 I read the registers and they are what I send them, but no LED light... Uising the GPIO Block I can set PWM and get the LED to turn on, but its 8 bit where this is 12 bit, so I like the resolution in this product. Anyway, I have also tried to write a program in Python based upon the C++ programs and looking at i2c MRAA examples in python, but so far no dice. I am sure at some point I can get this working, but progress is slow. If anyone has gotten this to work in Python, please throw me a bone! Note: I am new to Python and Linux and hardware programming in general, so any advice is appreciated. I have gotten the example in GITHUB compiled and working, but only by compiling it on the edison using make from the command line. I cannot seem to get it to compile and download from eclipse. There is an I2C voltage-level translator on this board it would be nice to have through holes to allow access to the outputs of this. If the board is used with outputs configured for push pull then it is necessary to remove / disconnect the pull-up resistors to avoid unwanted power loss. Also have to agree with request to change form factor. With a battery, I2C, microSD, base and PWM block this end of the stack of boards is getting very congested. Make sure the two MODE pins are set correctly, and use 0xfa-0xfd to quickly test all outputs at once. I'm having trouble getting the mraa's I2c module working, but the /usr/sbin/i2c* binaries work fine. I've gotten some of i2c to work using mraa (not if i'm doing things correctly), maybe we should make a thread on the forums; share findings. any updates on hookup guide for this? is the Hookup Guide available? Yes, using the address jumpers it is possible to stack 32. 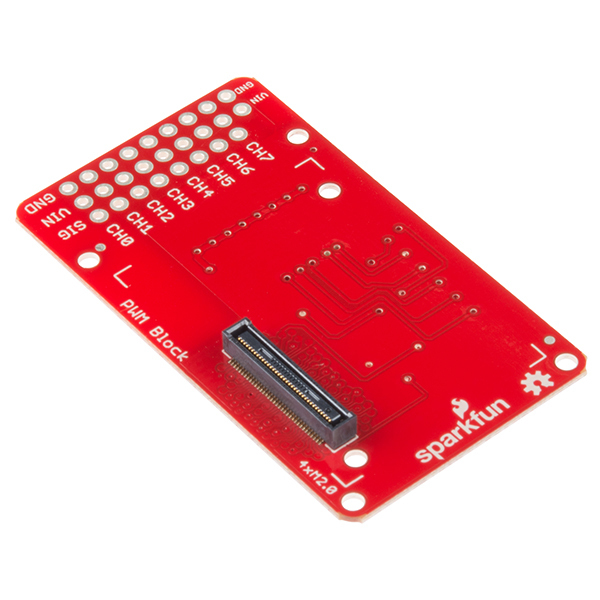 Can this board be used for reading PWM inputs? Or is the PCA9685 output only? If there's only 4 PWM output, how can it control 8 servos using PWM? How is this board programmed on the Edison? Either in the Arduino environment or in a native Linux environment. 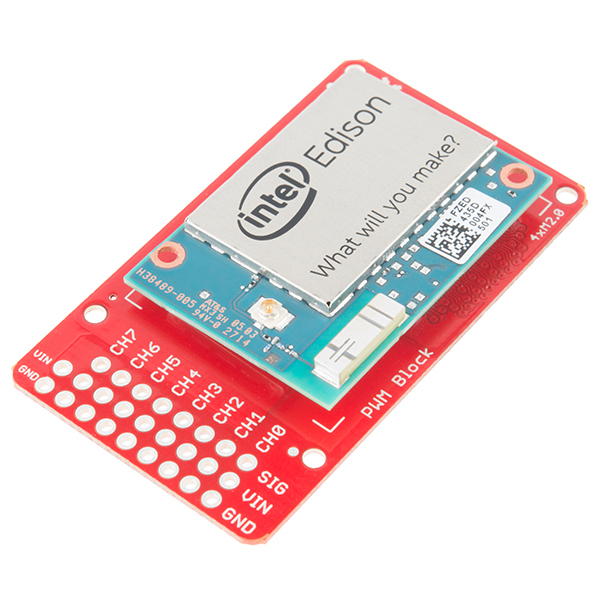 can the edison be powered by soldering a correct +V jumper to the "vsys" pad before the diode? looking for a way to add power without a separate block. 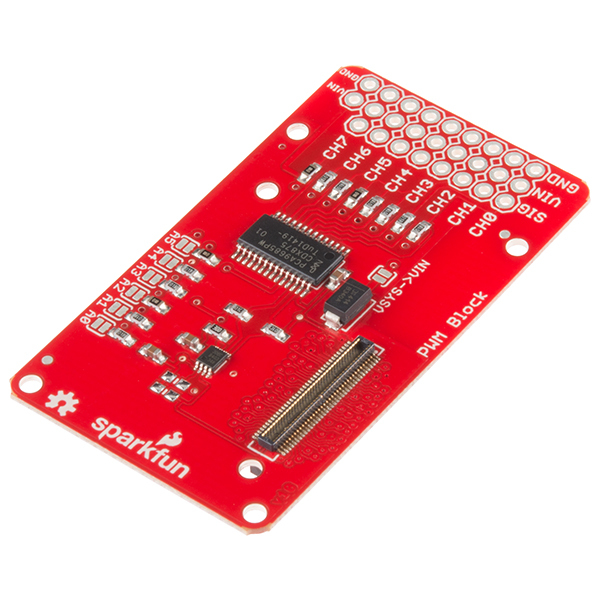 is there an assembled option with breadboard pins? will or can pins be supplied? What is the PWM output voltage? PWM output voltage is determined by VIN on the servo header. nice job! another new board! Does this allow for PWM in? Or just PWM out? Do you have a documentation package for the board some where? We are waiting until details are finalized and production units are ready. https://github.com/intel-iot-devkit/mraa/blob/master/examples/python/bmp85.py Here's an example of communication with an I2C device in python.